Work with Trumpeter Swans inspired pilots Terry and Mary Kohler who recently received awards at a gala event at the EAA AirVenture Museum in Oshkosh, WI. The Lindbergh Foundation recognized them saying "Terry and Mary Kohler's use of their aircraft to reintroduce swan and crane eggs in the United States is an excellent example of the Lindbergh Foundation's concept of balancing technology and nature". In 1989, The Kohlers responded to a request from the State of Alaska to help with a project involving the Wisconsin Department of Natural Resources and the USFWS. The Kohlers provided essential aircraft to bring Trumpeter Swan eggs collected from wild nests in Alaska to incubation and rearing facilities in Wisconsin. From a start with Trumpeters, the Kohlers went on to help with Whooping Cranes, Siberian Cranes, Humbolt Penguins, Piping Plovers and other species. Thanks Terry and Mary for your wonderful work! Last year 7 hunters were arrested in Missouri for killing Trumpeter Swans. Five of those cases have been resolved and the other two are still pending. Due to a recommendation from a staff biologist of the Missouri Department of Conservation, each of the five hunters was required to pay $750.00 restitution to TTSS, so that their fines would benefit Trumpeter Swan conservation. In addition, each had hunting privileges suspended for one year. TTSS is not against hunting. Hunters and anglers started the conservation movement in the US before the Civil War and continue to contribute a great deal to natural resource conservation today. However, sportsmen and sportswomen should be experts at identifying the game birds they hunt. Read a recent article detailing the history of Trumpeter Swan restoration in Ontario and the people who have made it happen! The article contains a great account of the program, but please realize the close-up photos are primarily of Mute Swans (orange knobbed bill), not Trumpeter Swans. Both species occur in that area. 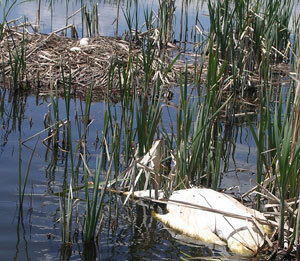 Check our Swan Identification page to learn about the differences. 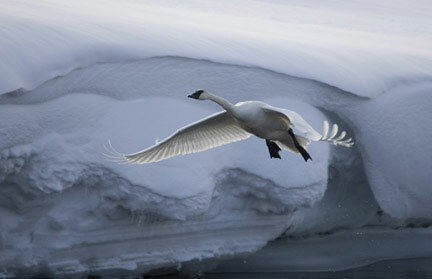 Over the past 10 winters, an average of 300 swans annually have died in this region from lead poisoning. Learn more about this very serious crisis with the lead poisoning information sheet about the most recent winter swan mortality in northwestern Washington and southwestern British Columbia. This is a progress report prepared by Environment Canada's Canadian Wildlife Service, the Washington Department of Fish and Wildlife, the U.S. Fish and Wildlife Service, The Trumpeter Swan Society, the University of Washington, and other organizations that have been working hard to locate the sources of lead shot and to stop the death of the swans. Read the entire 2008-2009 Progress Report. In its draft management plan for this refuge, U.S. Fish and Wildlife Service erroneously revised the refuge's establishment history to leave out all mention of Trumpeter Swans! 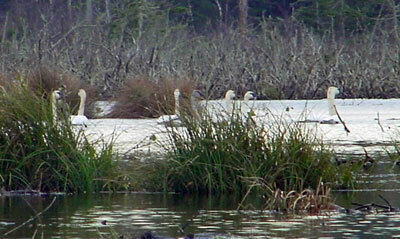 RRLNWR was established in 1935 to help save the last nesting Trumpeter Swans in the United States. The draft plan is completely inadequate with regard to Trumpeter Swan management actions and fails to recognize the importance of Refuge cygnet production to the security of the Greater Yellowstone nesting population. See TTSS' extensive comments to the U.S. Fish and Wildlife Service in which we summarize the deficiencies and make recommendations. The draft plan/EA is available at this FWS site. TTSS will provide a thorough update when the final plan, which will guide the management of the Refuge for the next 15 years, is released. Thanks to the generosity of the family of the late Amos D. Faux-Burhans III of Frederick, Maryland, TTSS has been making copies of the award winning video Trumpeter Blues available free to school libraries. Produced by Trailwood Films and TTSS member Bob Landis in 1987, the film follows a year in the life of a family of Trumpeter Swans in the Yellowstone Park Region. Teachers or librarians should contact the TTSS office to see about availability. Mystery of the Toxic Swans, a documentary film about the lead poisoning deaths of more than 2,000 Trumpeter Swans in Northwest Washington and Sumas Prairie, British Columbia, is now completed. This is a high quality production that explores the facts and follows the research to find the source of lead shot that has killed so many swans. It was aired on Canadian Television (CTV) on Saturday, January 24. We hope it will soon be aired in the U.S. and will post an alert when we hear of a date. This is a very dynamic documentary that was filmed in a variety of locations from our Conference in Whitehorse, Yukon Territory, to Washington State and several other locations around North America. TTSS helped in various phases of the production.